Time stole away. It was a little less than two years ago that I first stood in this cemetery, saying a final goodbye to D who was near and dear to me. 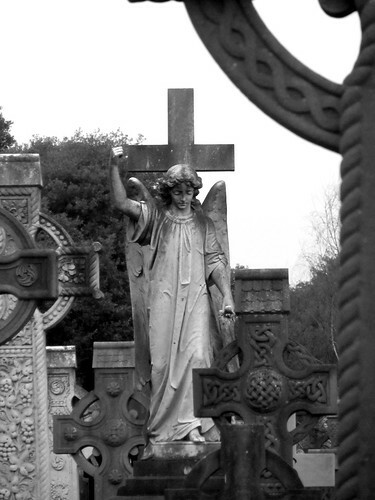 All around us were intricate Celtic crosses and guardian angels, lending an air of ancient culture meet religious symbolism, yet on a closer look, modern marble headstones are found peppered around the site, proof of style transition of death monuments over time. Personal association aside, Glasnevin Cemetery is managed by Glasnevin Trust, which functions include operating the Glasnevin Museum and in winter months, it even runs daily walking tour. The cemetery is the largest non-denominational cemetery in Ireland, and the graves of many prominent figures can be found here. I guess that makes Glasnevin Cemetery the Père Lachaise of Dublin?